Did Tom Ever Fly the Shuttle? Sadly, there are currently no known flown US $2 bills from the Space Shuttle program era. Coins and currency are not currently allowed to fly aboard the the Space Transportation System vehicle, even though it was a time honored tradition in the past. As Russ Still points out on page 285 of "Relics of the Space Race," this is a recent policy decision relative to the Shuttle: "Monetary items have been carried on many U.S. manned spaceflights. Although NASA spokesman Gloria Demers has indicated that it is currently against NASA policy to fly US currency, it does have a long history." (A long history to which my flown Jefferson's can clearly attest!) You can read about the restrictions on Shuttle cargo and personal effects at the following link on collectSpace. According to the listed regulations, astronauts on the Shuttle are prohibited from carrying "items such as philatelic materials and coins that, by their nature, lend themselves to exploitation by the recipients." This has been interpretated by NASA, I believe, to include currency. 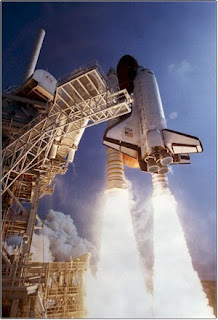 Therefore, the Jefferson-in-Space Museum will most likely never have a Shuttle flown exemplar. Although one can always hope, right? As of this writing, I am aware that some of the Russian cosmonauts that have flown on the shuttle to the International Space Station have carried currency with them -- and I have in my own collection a flown $1 bill from such a flight. But I am not aware of any $2 bills having been flown. Additionally, Purdue University students were reprimanded and their flown $1 bills confiscated, when they snuck them aboard via a University and NASA sponsored science project that flew on a shuttle mission. Those bills are in the possession of NASA. Therefore, if you ever hear of a flown shuttle $2 bill, please do contact me directly! I would be very interested in learning more about it, and perhaps acquiring it for the museum.